Do you have fancy dinner parties? With hors d’oeuvres and cocktails and stuff? Where women wear high heels and do their hair? Yeah, me neither. But sometimes, I see a recipe somewhere, and really, really wish I did. All of a sudden, I wish I was fabulous and sent out invitations to my glamorous friends and asked them to join me for an evening of sparkling conversation and overall classiness. Alas, I’m just not there. Nor will I ever get there, most likely. Sure, I have people over, and usually food is involved, and actually, we don’t do too badly with the sparkling conversation most of the time. But it’s not the same as having an all-out dinner party, complete with fancy canapés and a four course menu. Usually this is just fine with me; I’m not an exceptionally fancy person. But when I come across a recipe like this, I go to tuck it into my fancy dinner party file, and it turns out I don’t have one. What a shame. However, this past weekend, I decided what the heck? Why not just make a lovely appetizer and then eat it for no better reason than… lunch. And that is the tale of how I came to be eating Mortadella Smear with Arugula and a Balsamic Reduction at 2 pm on a Sunday afternoon. It was so lovely. The mortadella spread tasted like, well, mortadella, except mortadella that had died and gone to fluffy, delicious heaven. Like bologna mousse, in the best possible way. 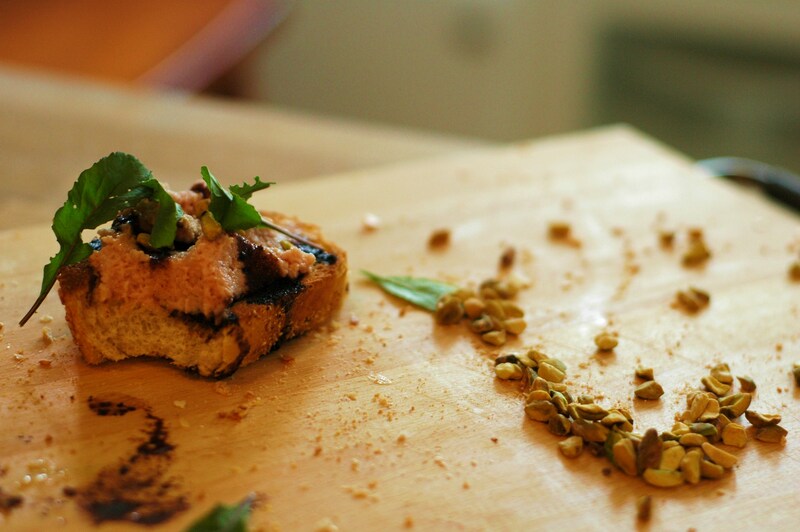 The pistachios added a beautiful crunch and that awesome addictiveness that pistachios always have about them. The balsamic cut through the rich mortadella like a dream, and the arugula kept the whole thing fresh and peppery. And do you know what? This tasted pretty darn amazing standing over the sink in the kitchen in sweatpants and bare feet. So much so that I couldn’t imagine eating it in heels. Especially since moaning and sighing over your food is generally frowned upon at dinner parties. Pour vinegar into a small saucepan and cook over medium heat until reduced to 3 tbsp., about 5 minutes; remove from heat and set aside. In a small saucepan, melt butter over medium heat. Whisk in flour and cook, whisking, for 1 minute. Slowly whisk in chicken stock and cook until thickened, about 2 minutes; remove velouté sauce from heat and set aside to let cool. 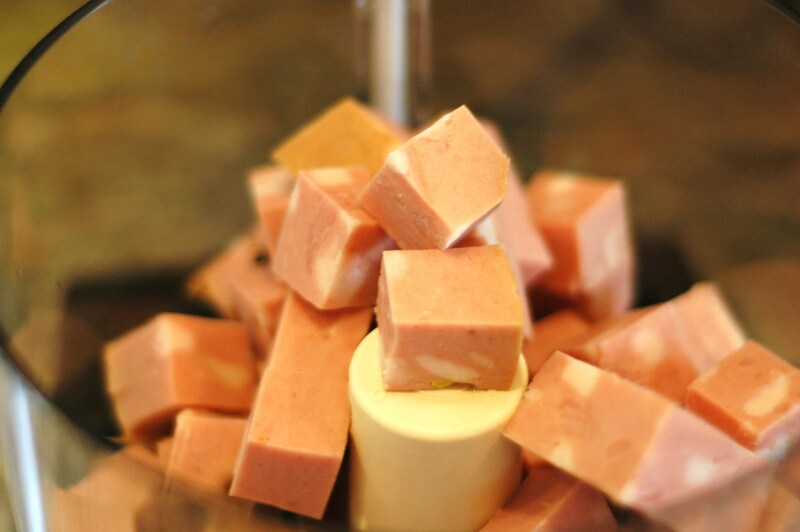 Put mortadella into a food processor and process until puréed. 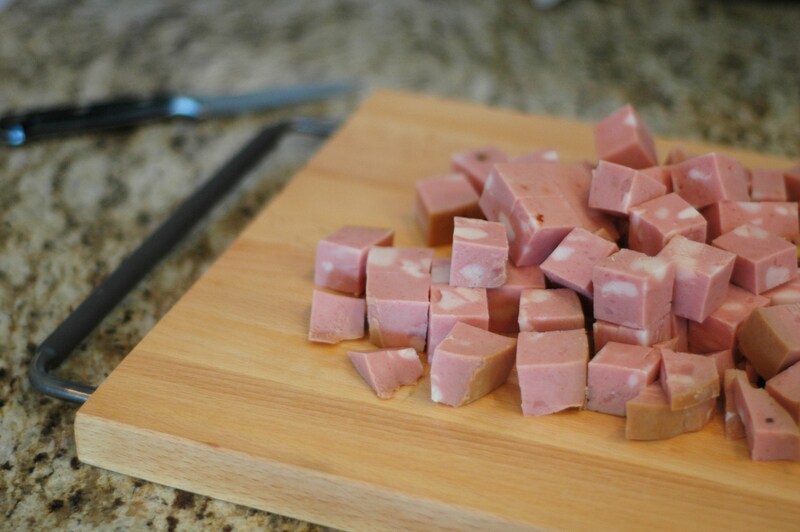 Transfer mortadella to a medium bowl. Using a rubber spatula, fold in the reserved velouté sauce and whipped cream; set aside. 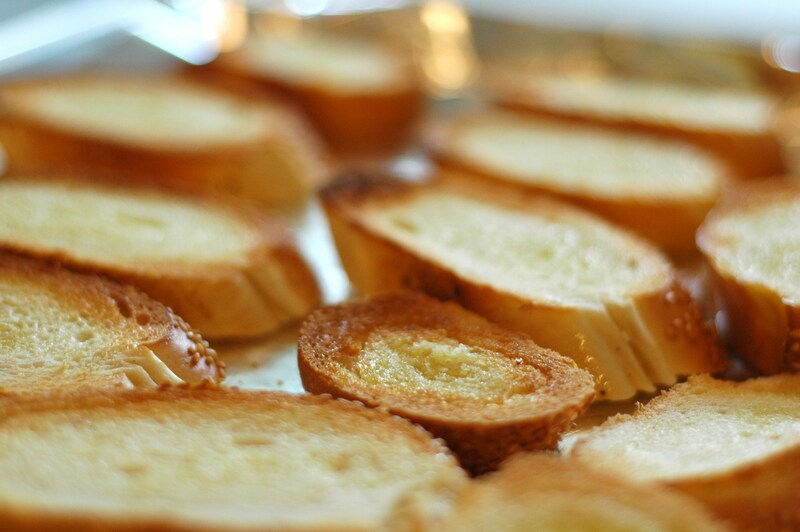 Rub the ciabatta with the oil and grill or toast. 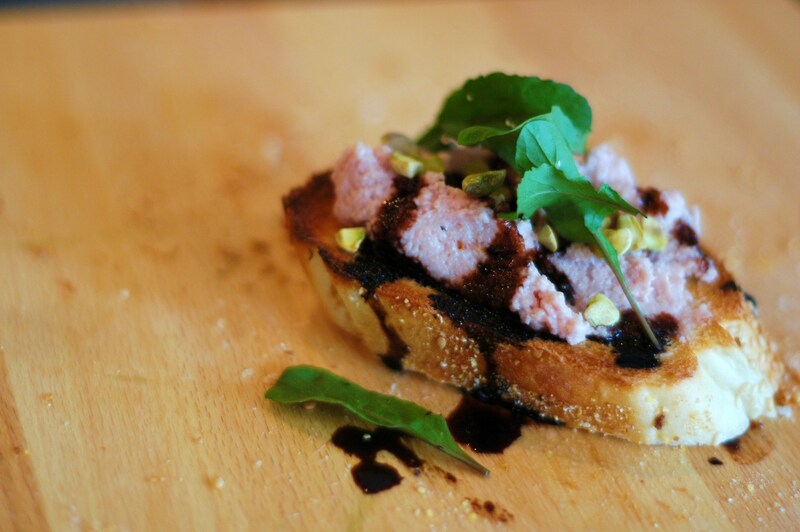 To serve, smear the grilled bread with the mortadella and garnish with a drizzle of the reduced balsamic and a scattering of pistachios and arugula. Serve warm or at room temperature. One of my favorites at the Purple Pig! Love it there. I am making this for Thanks Giving cocktail hour (no heals required) and keeping butimhungry.com on my radar. Hi Joe, This strikes me as the perfect thing for Thanksgiving, wish I would have thought of that. Hope this lives up to the “real thing” at the Purple Pig! Follow but i’m hungry on Twitter!